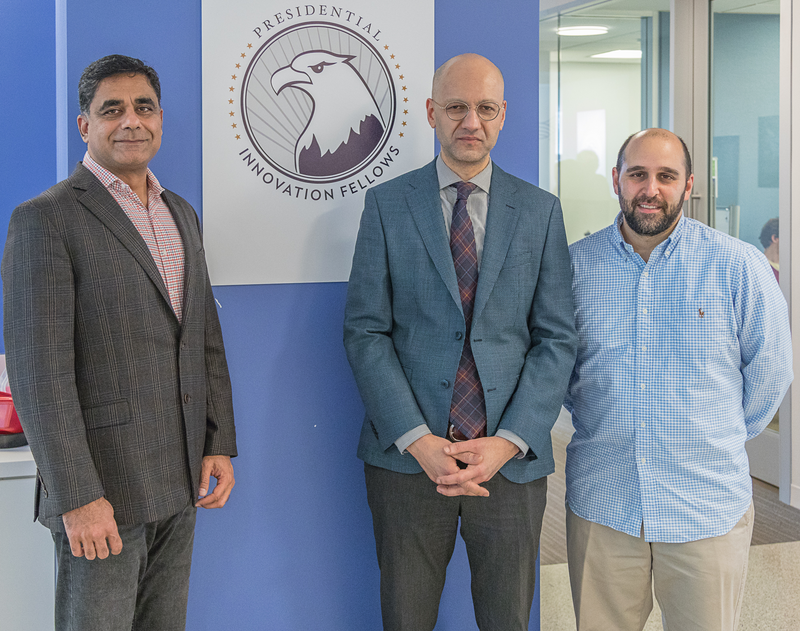 A new team of Presidential Innovation Fellows (PIF), Robert Goldel and Rana Saad, have begun their work at the Food and Drug Administration (FDA), applying data science approaches to device, drug, and software development, and the associated regulatory decisions. Project teams at the agency have been exploring ways to incorporate more digital tools into its own processes within the FDA, including the drug approval process. The FDA has also been reviewing how, through the software precertification pilot program, to streamline processes for reviewing digital technology that are medical devices. From left to right: PIF Rana Saad, FDA’s Dr. Sean Khozin, and PIF Robert Goldel. Photo by Jeff White, GSA. Robert Goldel will be working closely with Dr. Sean Khozin, the Founding Director of INFORMED on questions of digital biomarkers, artificial intelligence (AI), and machine learning approaches in medicine. Khozin and Goldel will also be coordinating and supporting FDA work groups establishing data science and algorithm / AI regulations, procedures, and programs that have national or international impact. Goldel believes the potential to link these technologies with traditional approaches in foods, medical devices, and pharmaceuticals is where personalized medicine is headed. “I’m looking forward to learning from the amazing people and history at the FDA. The future of digital health depends upon their expertise and passion to ensure the regulatory frameworks for software as medicine and the wide diversity of new technologies,” Goldel adds. Rana Saad will be working closely with Mr. Bakul Patel, Associate Director for Digital Health in the FDA’s Center for Devices and Radiological Health, on standing up the infrastructure and organization needed for the Digital Health Unit at the FDA that is responsible for the software Pre-Certification pilot program (Pre-Cert) – which is going to help develop an innovative regulatory paradigm which will be designed to maximize safety of medical devices while matching the speed of innovation to realize the full potential of digital health technologies. Patel and Saad will also be coordinating and supporting the FDA to build its bench strength to prepare to be digital future ready. To apply directly to our program, please visit our website to begin your application process for the Summer 2019 Cohort.